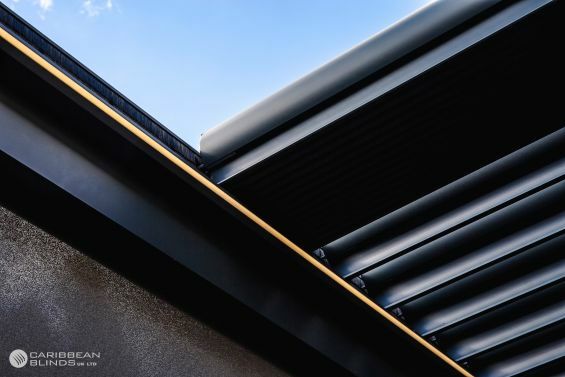 Since the launch of our Prestige Outdoor Living Pod™ last year we have seen this quickly become the model of choice for garden landscapes across England, whether that be residential or commercial, the sliding louvered roof system has been an alluring feature for all. 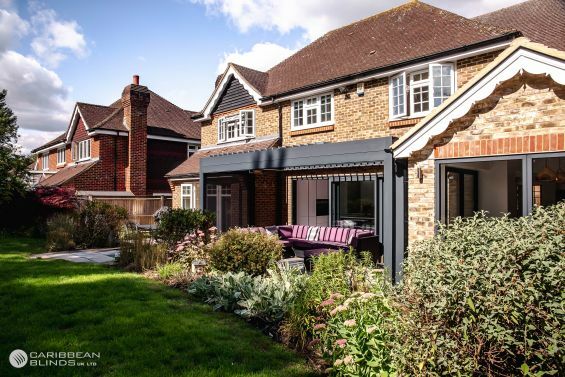 A particular project in Surrey saw the louvered pergola integrate within a residential building, creating an extension of the home, which is why we sent the Digital Team over to capture the bespoke elements that have made this project special. The clients had a generous garden space with a lot of potential to make more enhancements. The outdoor garden pod was an instant attraction as soon as you walked in, the integration of the louvered canopy to the building was seamlessly astonishing. The pergola sun shade was positioned dead centre of the building leading into the heart of the home, the kitchen, this is a combination we often see as the kitchen can quite often become the social aspect of most homes. The large contemporary sliding doors connect the open plan kitchen with the dedicated outdoor living area to unify both spaces, creating a healthy indoor outdoor experience for all to enjoy. Within the height of summer you know without a shadow of a doubt that these spaces will be enjoyed constantly by the whole family, but this space is not just for summer, the design and features of this Prestige Outdoor Living Pod™ give it the ability to be used all year round no matter the weather. 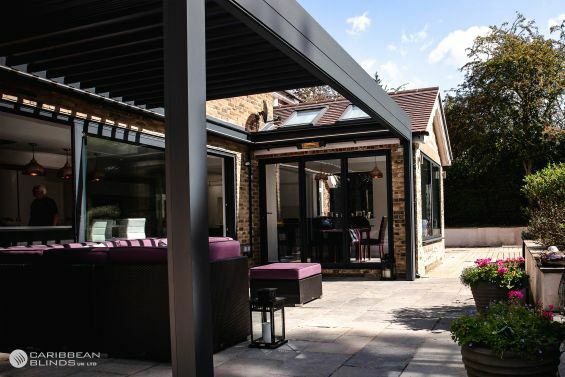 This retractable roof pergola has been specially engineered to adapt to all scenarios to provide the users with the best outdoor living experience. 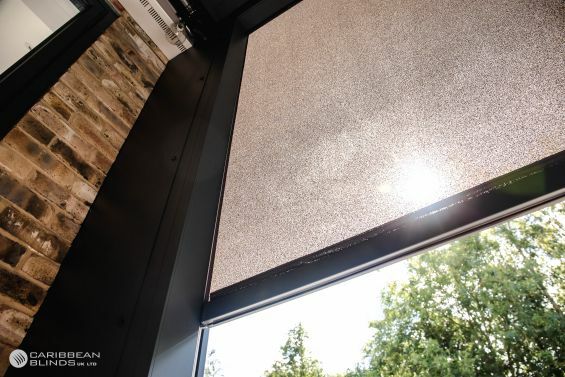 It features weatherproof side screens that deploy at the touch of a button to protect against wind, rain and sun. It has an integrated guttering system that will keep the space dry from rain and snow. 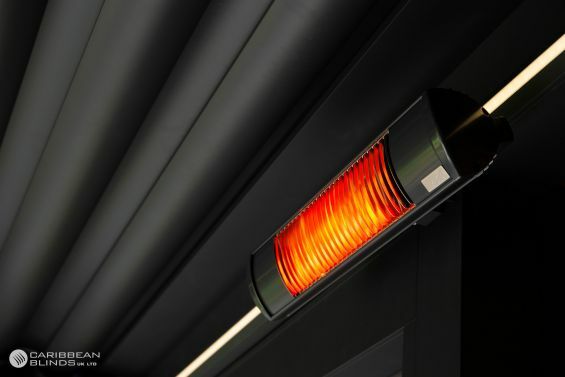 Infrared heaters to keep the area warm and cosy on the colder days and LED lights to extend your time spent outdoors. 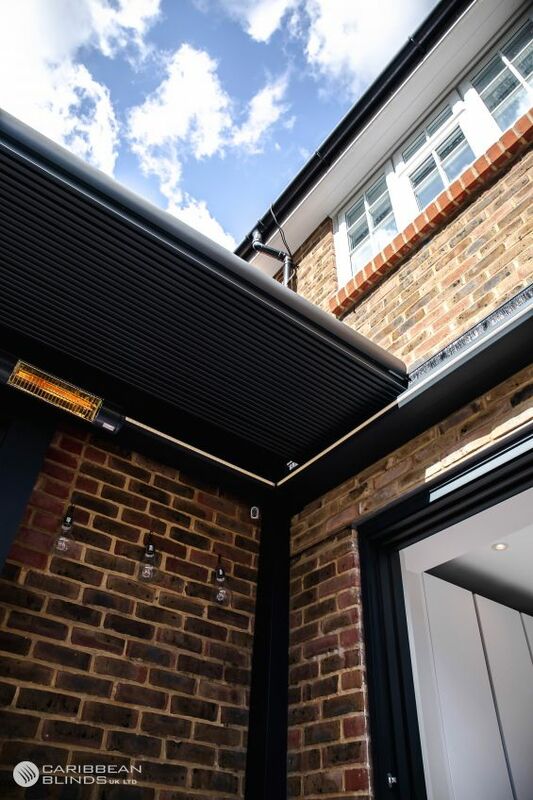 The sliding and rotating roof is the pinnacle feature that can completely change the feel and use of the space when combined with the other features. 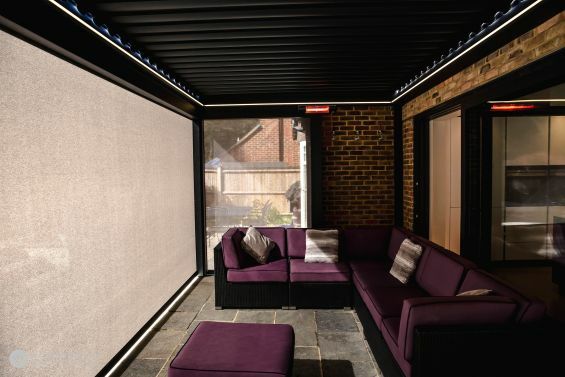 The louvered roof system gives you full control of how much light you want to let in to your dedicated outdoor living area, it can be fully closed to create an extra room that will not even have an essence of outdoors and when fully open you can restore that connection with the natural outdoors and be completely entwined with the garden. The bespoke elements of this project is what has made it possible for the clients to have a naturally flowing harmonised space that can transform at the touch of a button. 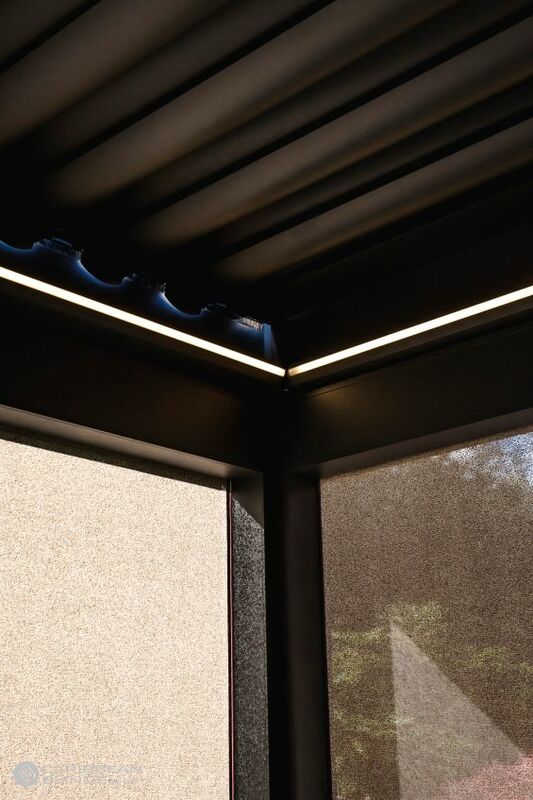 Integrating the Pod into the building has enabled them to connect spaces seamlessly, by attaching the main cross beam to the façade of the building we were able to create that instant connection from the internal space to the external. 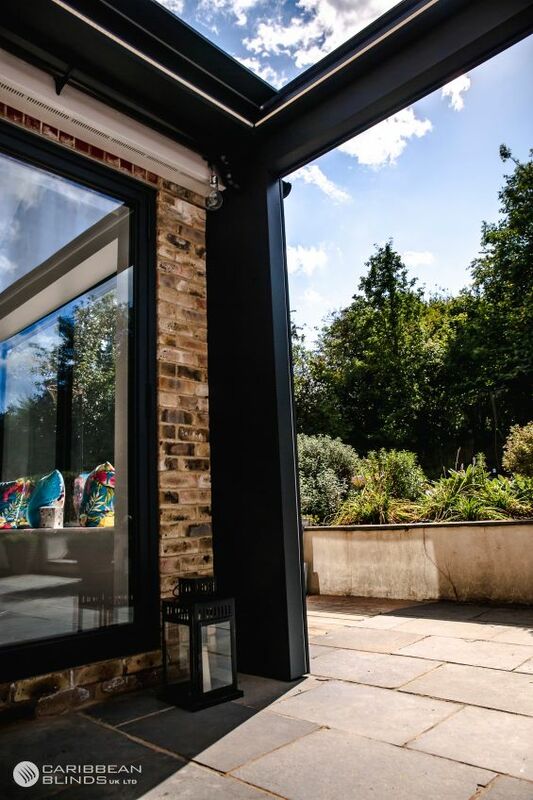 It was vital for us to cover any gaps so that we had a completely enclosed space, this was made possible by designing some bespoke aluminium infills to fill those areas, and even exposed gutters were covered to create a neat finish. Every detail was taken care of by our experienced surveyors and designers to ensure that we left our clients satisfied with a space that they can use all year round to improve their health and wellbeing and lifestyle. If you would like to know how we can transform your home or commercial property then contact us to discuss your options 0344 800 1947 or alternatively you can request a free detailed brochure using our quick enquiry form.